March 26, 2018: American Mythology, the Maryland-based publisher of comic books and graphic novels, is proud to spearhead a bold new era for fantasy and adventure with “Fear on Four Worlds,” an epic event that unites the iconic heroes of literary great Edgar Rice Burroughs into a shared comic book universe! Beginning with the special one-shot Carson of Venus #1 in June, the four-part “Fear on Four Worlds” storyline will continue across additional special issues in the ensuing months: Moon Maid #1, Pellucidar #1, and The Land That Time Forgot #1, and the aftershocks of this cataclysmic event will ripple through individual miniseries throughout 2018 and beyond! The first chapter of “Fear on Four Worlds” premieres with Carson of Venus #1, written by the talented Christopher Mills (Gravedigger, Femme Noir) and debuting the gorgeous art style of newcomer Cyrus Mesarcia. Two worlds collide as a group of unlikely explorers from Caspak – the prehistoric realm known to Burroughs fans as “The Land that Time Forgot” – leap across our solar system to the danger-fraught landscape of Venus. Stalked by alien beasts and treacherous villains, their only hope for survival lies in a legendary figure from eighty years in Earth’s past: long-lost astronaut Carson Napier! American Mythology’s line of Carson of Venus, Moon Maid, Pellucidar, and The Land That Time Forgot titles are officially licensed from Edgar Rice Burroughs, Inc. Comic book fans and ERB enthusiasts are no stranger to seeing Burroughs’ iconic heroes in four-color adventures, courtesy of the bestselling Warlord of Mars and Dejah Thoris series currently in print. In offering an expanded universe of titles to the Burroughs mythos, American Mythology is proud to build upon the successes of recent years and entice new sci-fi fantasy audiences to the comic market. 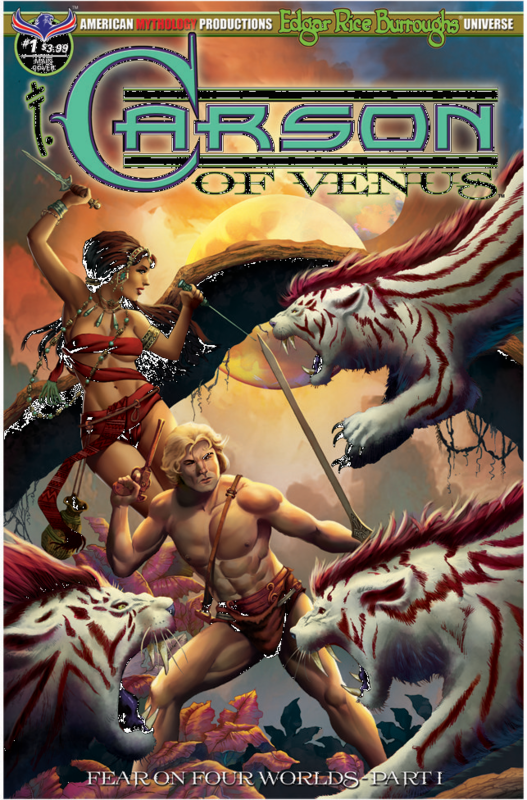 The Carson of Venus #1, debuting “Fear on Four Worlds”, will be solicited in Diamond Comic Distributors’ April 2018 Previews catalog, the premier source of merchandise for the comic book specialty market, and slated for release in June. Comic book fans are encouraged to reserve copies with their local comic book retailers.